Medium may be the blogging platform du jour but Automattic's WordPress.com has quietly become the platform to be reckoned with. Automattic is now hosting more big-name sites than most realize, and now it is adding features which are changing WordPress.com into something more than just a blogging platform. The company is launching a new integration for Chrome that lets you write, edit and collaborate in Google Docs, and then effortlessly save and publish your pieces straight to your blog. The add-on will come in handy to writers and bloggers that rely on the popular content management system to publish their stories, but opt to crank out content in third-party text editors to avoid losing work as a result of unexpected errors – we all know how disheartening this could be. 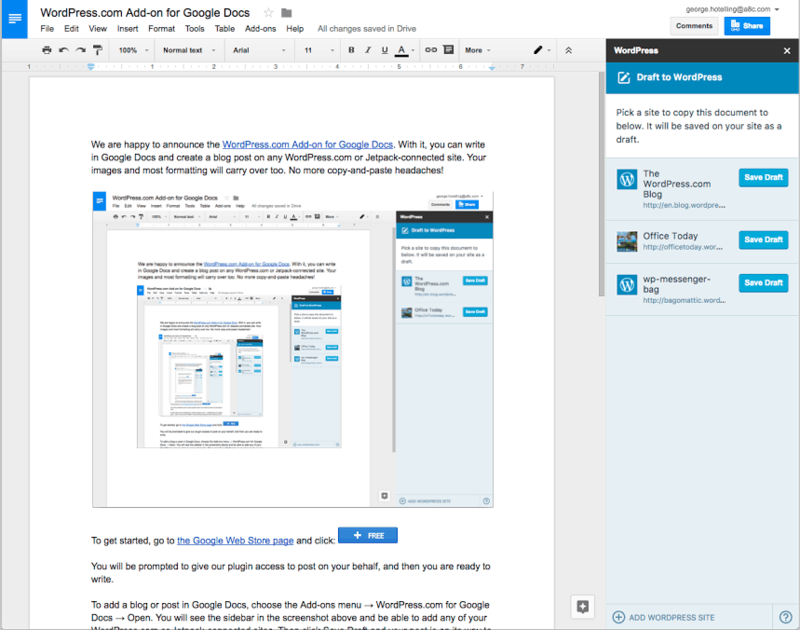 Instead of resorting to text-editing apps such as Simplenote and Dropbox Paper like TNW’s own Abhimanyu Ghoshal, WordPress.com for Google Docs offers the convenience of using both at the same time. When it rolls out, WordPress for Google Docs is going to be part of Jetpack. it will be available for any WordPress site - both on WordPress.com and self-hosted - that uses the plugin. It is still under development at the moment, but if you want to try it you can download a copy from Github.